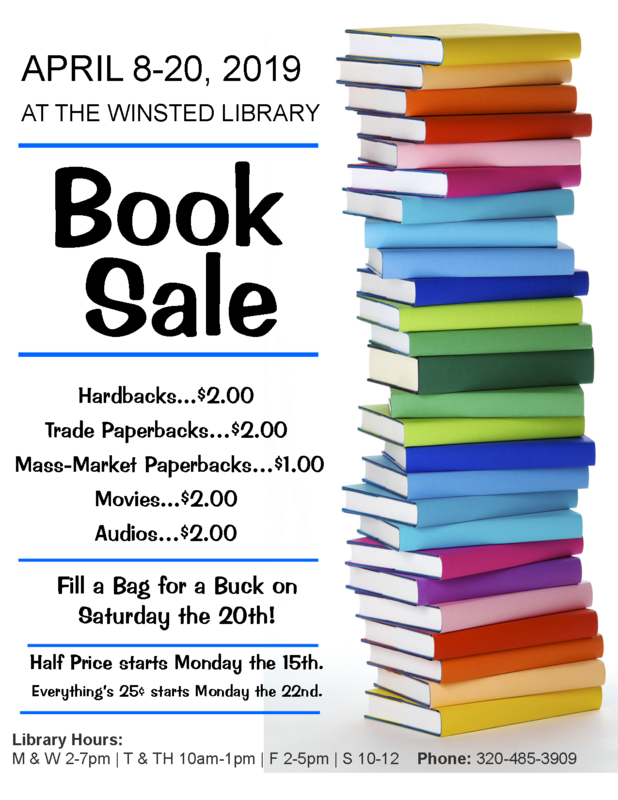 It’s (Almost) Book Sale Time! Winter Reads 2019: Snow is Falling, & Books Are Calling! 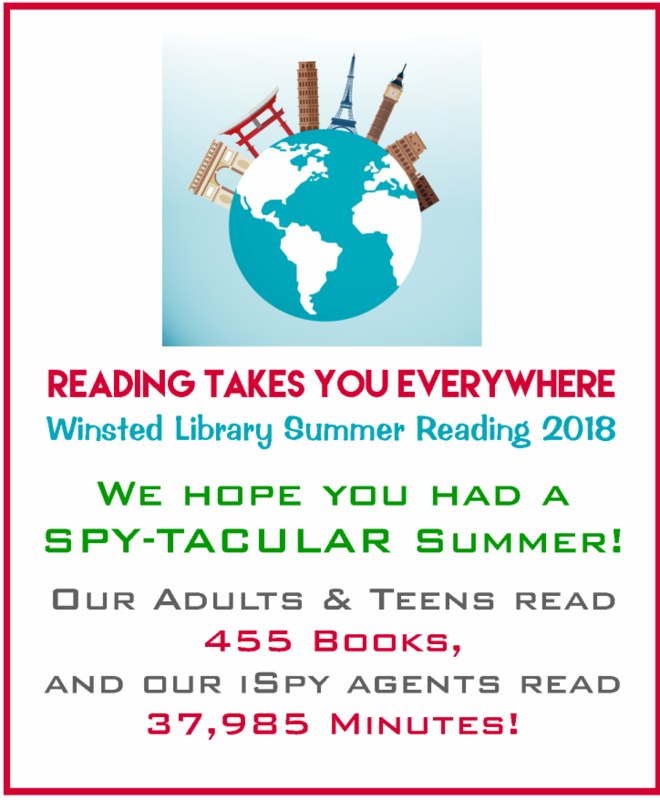 Participating is easy–just sign up at the Winsted Library, and get your reading log to keep track of what you read from January 1st-March 15th. 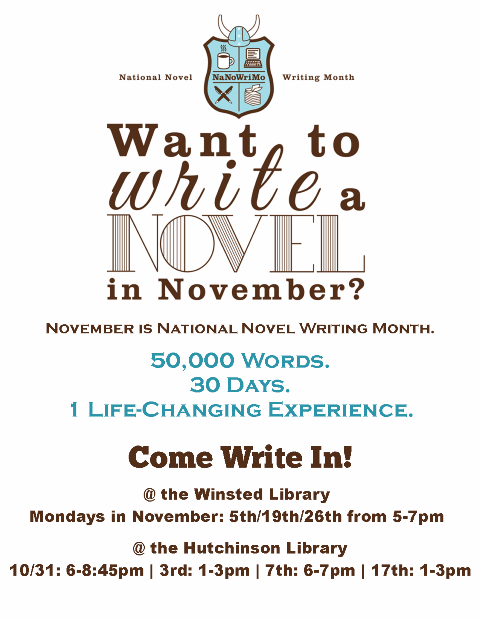 There are monthly challenges for you to try, or you can read what you want, in any format. Just remember, the more you read, the more points you’ll earn; the more points you earn, the more prize drawings you’ll be able to enter! Help Us Spread the Love in 2019! and the time for their largest food and funds drive of the year. 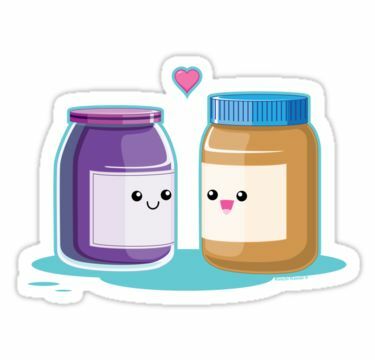 To participate (and earn 2 points for your Winter Reading Log), simply bring in a jar of non-perishable food that can be spread, like peanut butter, jelly, honey, mayonnaise, mustard, relish, ketchup, barbeque sauce, or whatever you find. bring in up to 3 more items, and we’ll take up to $3 off your fines! *Unfortunately, no home-canned items can be accepted. *All items will be donated to the McLeod County Foodshelf. 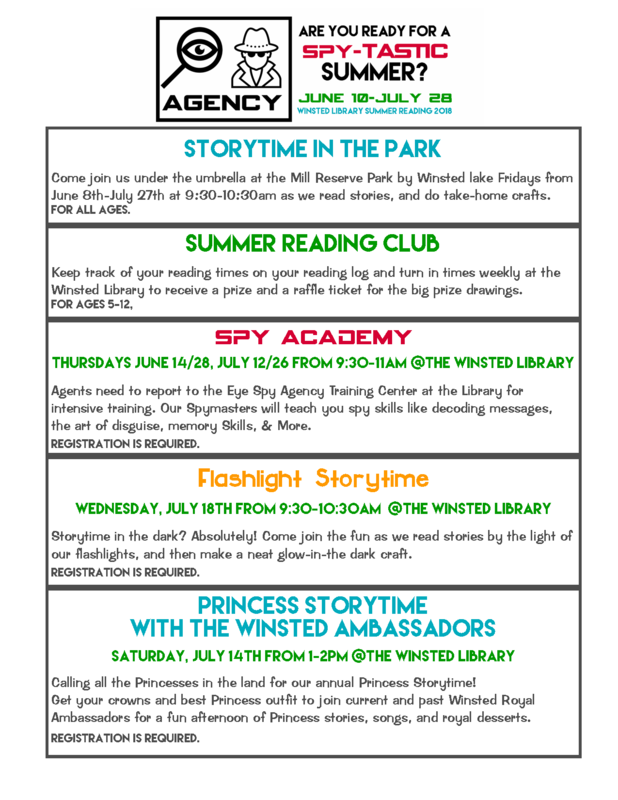 *Winsted 2019 Winter Reading Program is open to ages 16+. *Turn in your reading log by 5pm on Friday, March 15th to be eligible for the prize drawings. 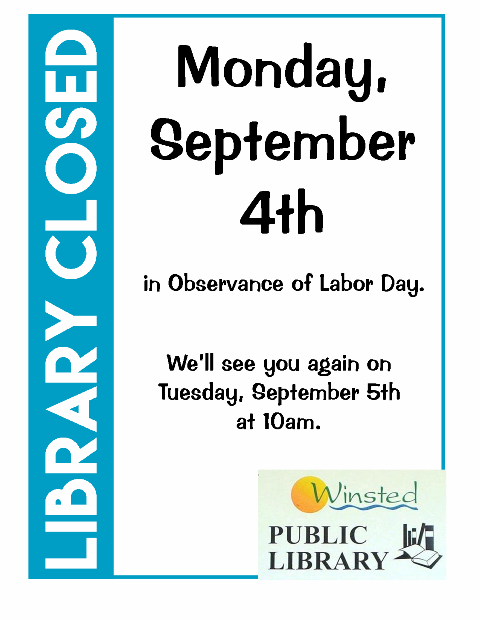 Pioneerland Library System & the Winsted Library Commission. 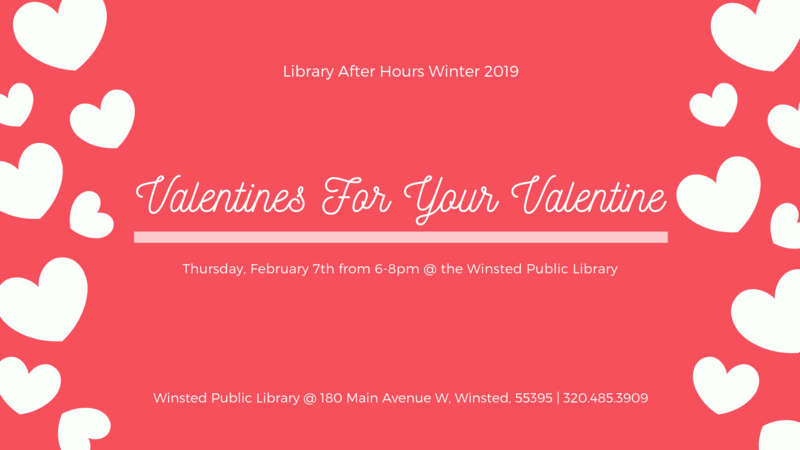 Come make 2 valentines for your Valentines at this Library After Hours session! We’ll also learn how to make small gift boxes that are the perfect size to fill with some sweets for your Sweetie. 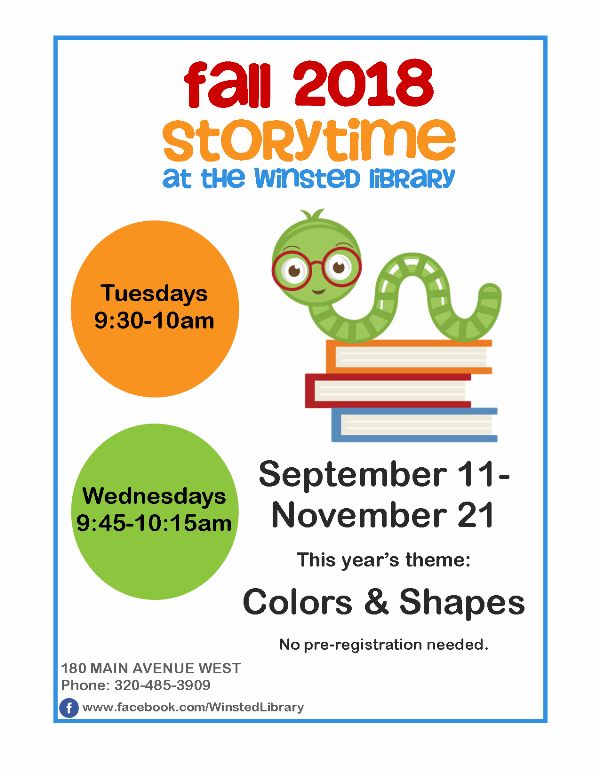 Space is limited to 15 participants, so register by stopping in at the Winsted Library, or by calling 320-485-3909 to reserve your spot today! 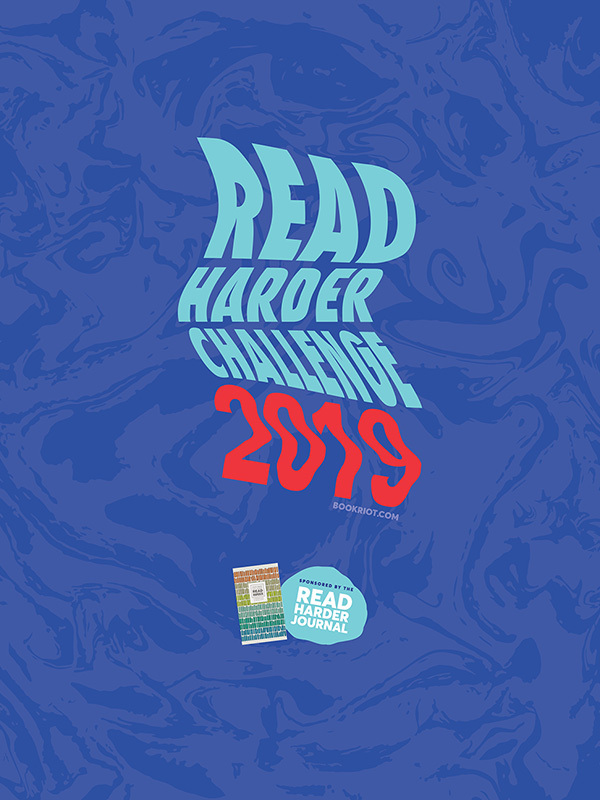 Want to explore more reading challenges on your own in 2019? 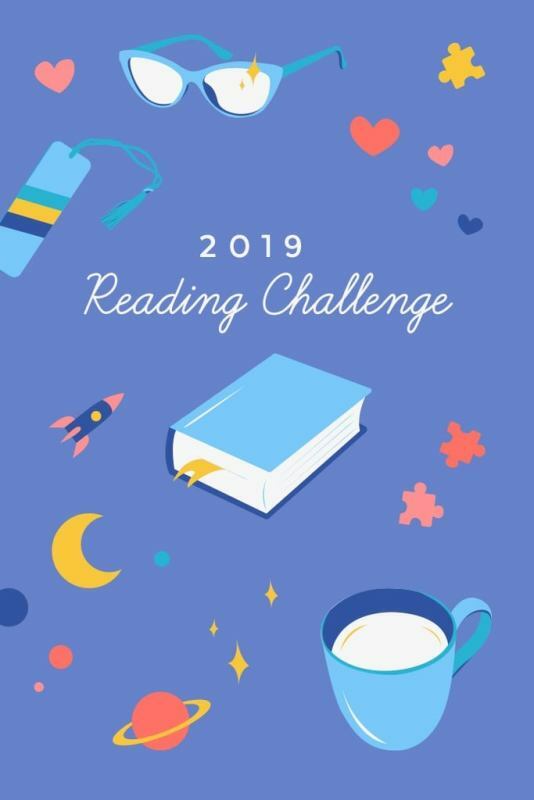 Two of our favorite year-long reading challenges are from POPSUGAR and Book Riot. For their reading challenge records, click on the pictures below. 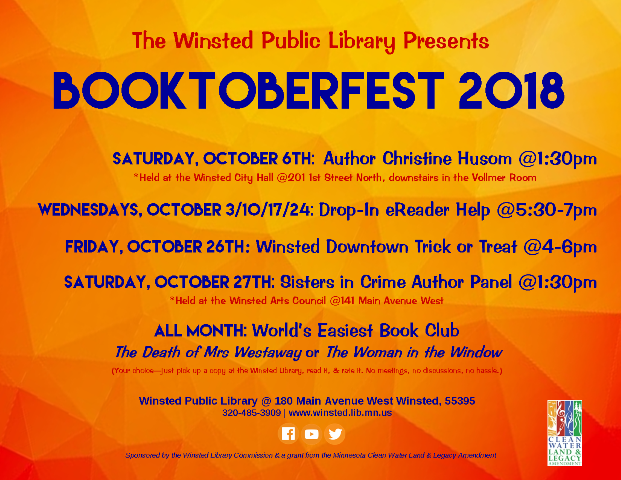 It’s October, and it’s time for our first annual BOOKTOBERFEST! 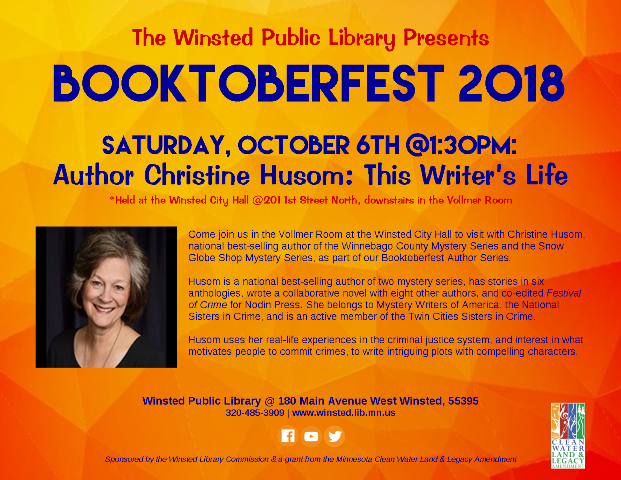 We’re starting off the celebration with local author, Christine Husom, who is coming to talk with us on Saturday, October 6th in the Vollmer Room at 1:30pm about her writing life, and her two great book series. 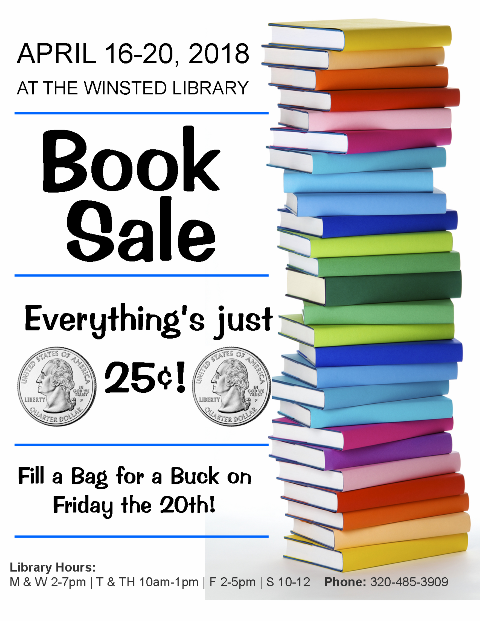 Then, you can come join in the World’s Easiest Book Club at the Winsted Library. 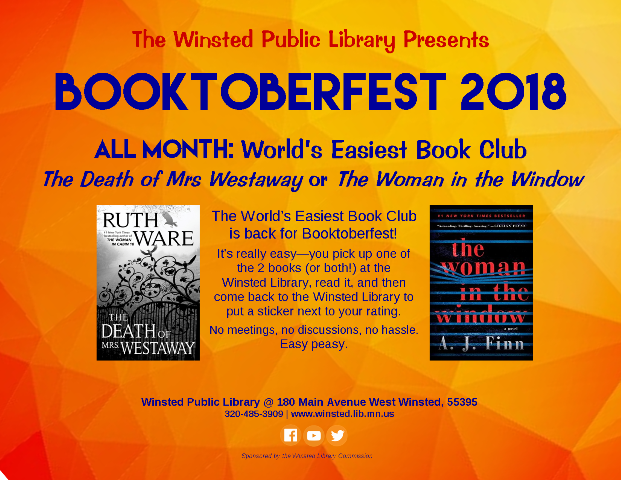 Choose between ‘The Death of Mrs Westaway’ by Ruth Ware, or ‘The Woman in the Window’ by AJ Finn. Read one or both, then come into the library to put a sticker by your rating. No meetings, no discussion, no hassle. 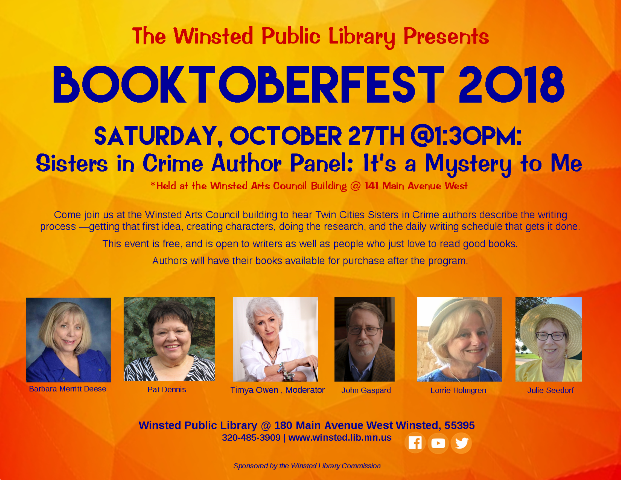 We’ll round off the month with a Twin Cities Sisters in Crime author panel coming to the Winsted Arts Center to talk about how the writing process–from coming up with that first idea to setting a writing schedule to get it done, in their “It’s a Mystery to Me” presentation. No registration is needed for any of these events, and best of all? They’re FREE! The air is getting crisper, and the leaves are starting to turn fabulous colors. What better way to enjoy Mother Nature’s show than to go on a riverboat cruise to Harriet Island? 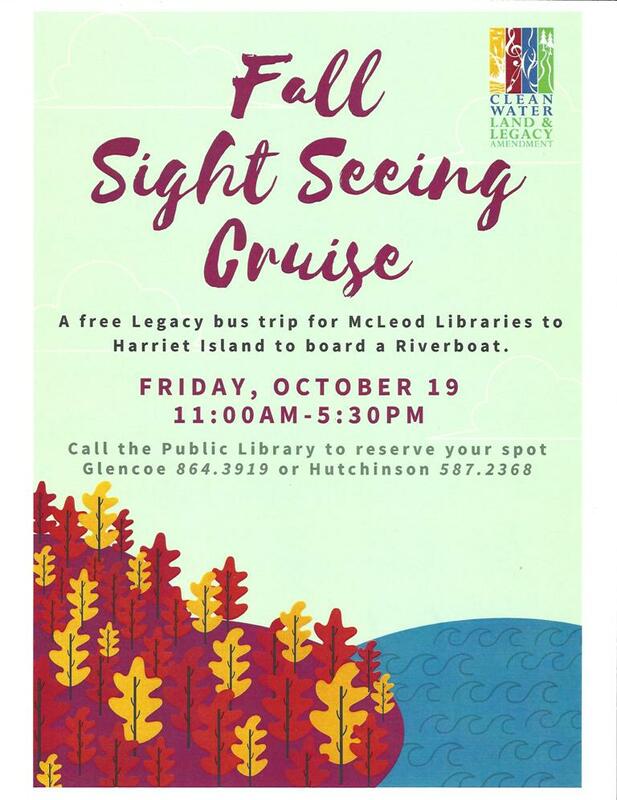 There are SEVEN seats that are for Winsted Library Patrons, so if you want to go, call the Hutchinson Library at 320-587-2368 to reserve your place today! 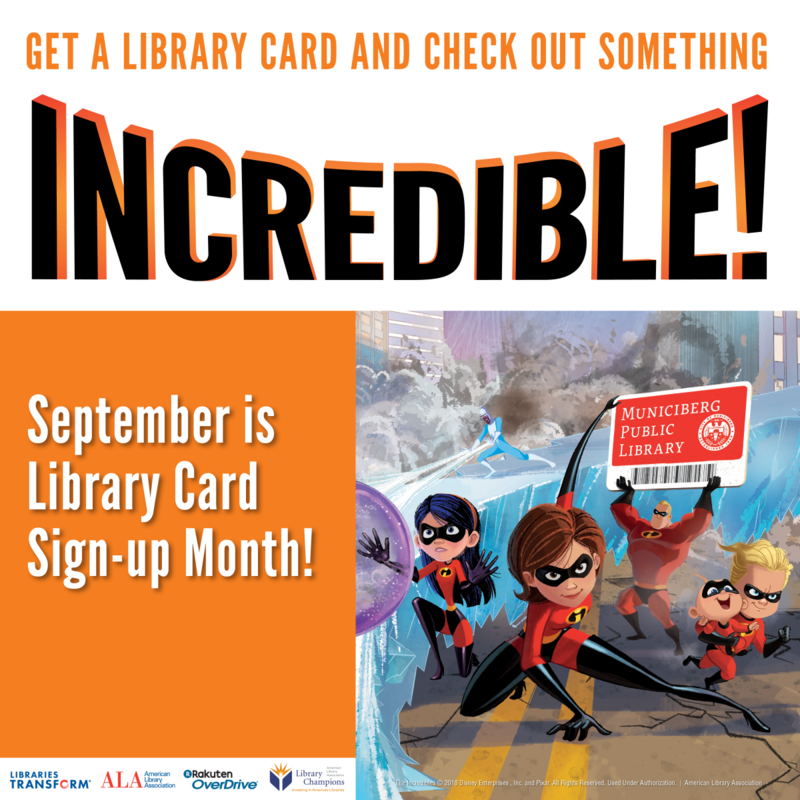 September is National Library Card Sign-Up Month! September is Library Card Sign-Up Month, and it’s INCREDIBLE how many things you can get with your Pioneerland Library Card! One card gives you easy access to all the materials in the 32 Pioneerland Library System libraries, including books, CDs, DVDs, magazines, and so much more. It’s easy to request an item in our online catalog, and have it sent to the library of your choice. You also have 24/7 access to all of our online resources, on any device. What else can you do with your library card? You can borrow new movies instead of renting them. You can put holds on books and other items even before they are available at stores. You can borrow eBooks and eAudios from Overdrive. You can access multiple databases to help with homework or other research. You can learn a new language using Powerspeak Languages. You can get discounted admission to the Minnesota State Fair during their annual Read and Ride Day. There are so many incredibly good reasons to have a library card, so come get yours today! 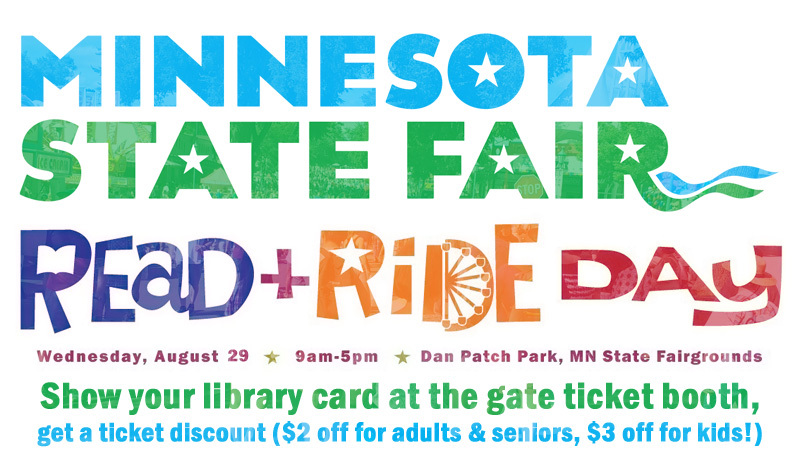 Wednesday, August 29th is Read & Ride Day at the Minnesota State Fair! Are you going to the Minnesota State Fair? If you have a public library card, you can get a discount on your admission ticket on Wednesday, August 29th for the fair’s annual Read & Ride Day! Just show your library card at the entrance gates, to get $2 off for adults (13-64), & seniors (65+), and $3 for kids (5-12). As part of the celebration, library ambassadors from all over the state host a Read & Ride Day Library event in Dan Patch Park (in front of the Grand Stand), and there are free family activities throughout the park from 9am-5pm. There will also be deals on merchandise and food for all fair guests, and all-day specials will be offered on Mighty Midway and Kidway rides & games. Wow! Reading really DOES take you everywhere! Where can summer reading take you?